It is a beautiful morning in the neighborhood! Aly and I have been sitting here in the living room watching card making videos on You Tube, Aly really likes Kristina's videos and of course her Mommy's Friday Card Flicks..ha ha. Anyway, so we are sitting here and hear this big "Whooosh". I knew immediately what is was so I grabbed my camera and ran out the back door. YUP it was a hot air balloon. We live in a hot air balloon flight path and not until today did I realize how close we were. We live about 2 miles directly south of were I grew up and as a kid I remember waking up to the noise of hot air balloons on Sunday mornings. By the time they were at our house they were pretty high up in the air. This one was close, no wonder why he kept "whooshing", he was trying to get up higher. This first picture is kinda funky, of course the sun was right smack dab in front of me so I pointed the camera, closed my eyes and shot. I didn't realize how fast those stinkin' balloons move, so as soon as I took the first picture I ran out front and got this one. I of course didn't have the settings correct on my camera so they are a little dark, but hey it was exciting! Funn y how I get the same rush of excitement when I hear that noise. I felt like a little kid again..yippee! Now on to my Scrappin' Sunday page. I used the sketch from Sketch This, it is number 50 and there is a prize involved. Go check it out and get scrapping! I have had the little snail eyelets from Eye-Lets-Etc forever. I am so happy that I finally have a page to put them on. My sweet little Corbin, wow he has grown up so fast! 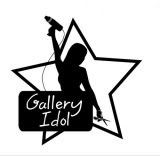 These pictures were taken in 2001, wow 7 years ago how time flies. Well I hope you have a great rest of your weekend! Mine has been extended... I am a SAHM again, for a little while anyway *HUGE GRINS*. Al is so supportive and my kids are happy to know that I will be ar ound in the morning to take them to school. Plus I will get to enjoy field day with my kids this week. I am so excited!! This is awesome- I love the little details! Cute page! I guess congrats are in order....I was wondering what the comment meant regarding no more icees!!! I love this LO the design is great! 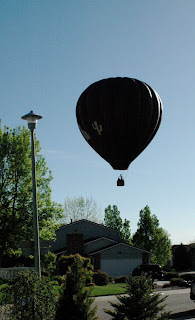 Wow what a cool experience to have a hot air balloon right in your yard! Love your page! Hope you had a great weekend! Love the hot air balloons. I usually see them from my house way up in the air with the mountains behind them. So beautiful! 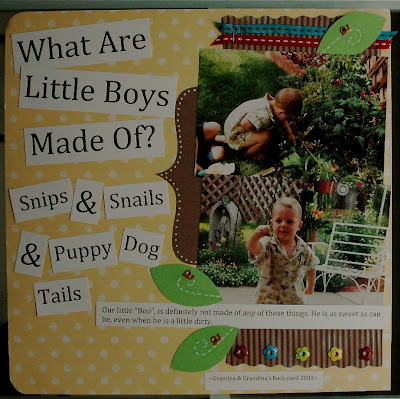 that page is fabulous---what wonderful details...makes me want to get out my pictures and scrap some! very cool to be in the flight path of the hot air balloons too!!! fun! 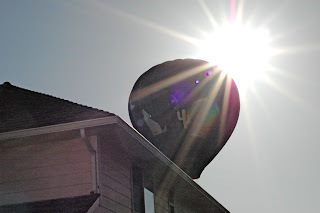 How fun to read a Hot Air Ballon story on your blog.. I grew up Ballooning that was my dads profession. We would go to Grand Junction every now and then for a Balloon Rally. My dads business was in Park City, Utah. 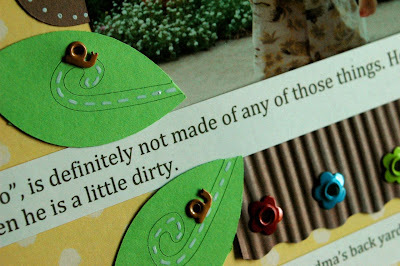 Love the scrap page.. All the little eyelets are so cute..